Panda presents Bachelors of Science. The production duo from San Francisco have been on a roll ever since they started injecting their unique blend of soul and strings into the Drum 'n Bass genre. 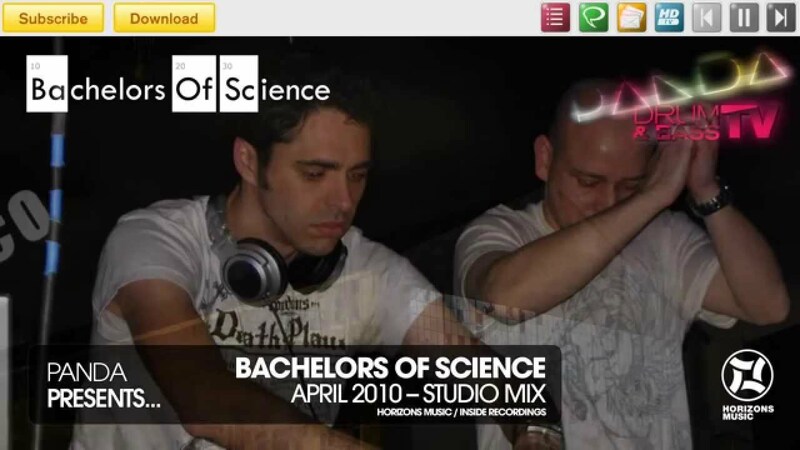 Bachelors of Science consists of Rene, a classically trained musician from New Zealand who was raised in the UK, and DJ Fokus, known for his work in jungle music. After producing their first tracks, they quickly gained attention from most A-list DJs including Grooverider, Annie Mac, High Contrast, Alix Perez, Blu Mar Ten, Basement Jaxx and Makoto, as well as raving reviews by MixMag, XLR8A and KMag. Soon after their debut album Science Fiction on Horizons Music was released to critical acclaim and become one of the biggest selling Drum 'n' Bass albums of all time, spending over nine weeks in the Drum & Bass Arena charts and winning 'Best Drum n Bass Track' at the 2009 Beatport Awards. Touring the world in the last year, they have performed for their fans at the legendary Love Parade, the Ministry of Sound and many more major venues. Their new album "Warehouse Dayz" has been in the works and is now fresh off the press. It is released on Horizons Music and features 11 of their best new works and can be ordered from http://bachelorsofscience.com/… and Beatport. In this artist-only mix, Bachelors of Science present us an hour long showcase of their best work from old to brand-spanking new. Lock in and leave your appreciation in the comments!